We have crossed paths with our friend Emyr two more times on his pilgrimage to North Wales. We met with a small group last Wednesday for his arrival in Llangeitho, about one third of his planned route. This painting from 1912 was in the vestry of the chapel. 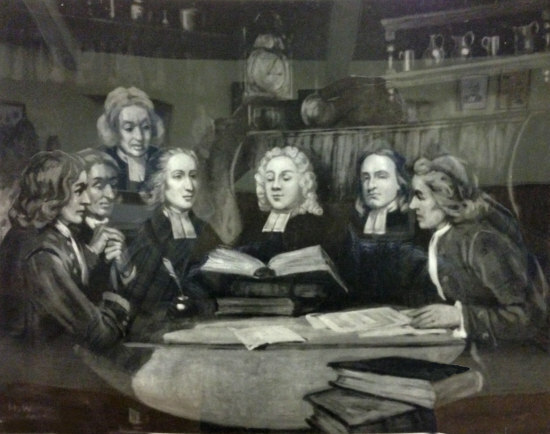 It is titled Y Sasiwn Gyntaf, The First Session, a meeting that took place in 1743, and shows George Whitfield in the center with the open bible. Daniel Rowland and Howell Harris are to his right, and to his left is William Williams Pantycelyn, a famous Welsh hymn writer. All were key figures in the Welsh Methodist revivals of the 18th century. I was impressed by the painting, and could almost sense the atmosphere of reverence and awe as they discovered together new levels of understanding of God's word. It brings to mind of the brethren waiting on the Lord in the upper room just before the first outpouring at Pentecost. 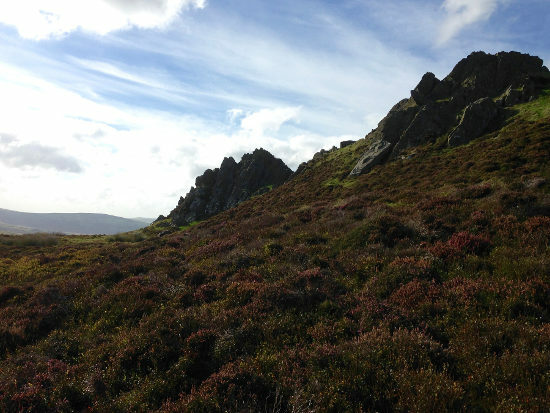 Then yesterday afternoon we had to go to Aberystwyth for an appointment, and knew that Emyr had headed north from there in the morning to Tre'r Ddol, about 10 rainy miles away. In another instance of God's incredible timing, when we got to the one crossroad in the tiny village, and there he was standing on the corner where he had just arrived and set the cross down to take his bearings! 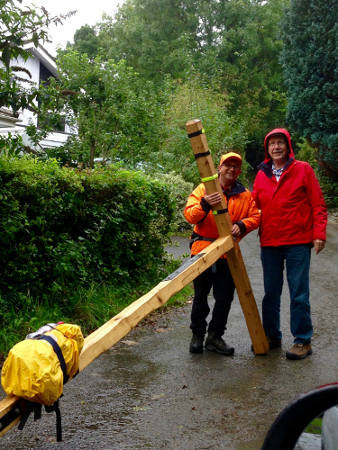 If you'd like to read some more about his experience so far, there are some good updates just posted on his web page http://crossingwales.org. There is also complete information about the route and dates on the "Pilgrimage" tab. This is just one more of the encouraging things that happening around Wales, and we look forward to more to come. As we see more members of the Body of Christ coming together to seek the Lord in prayer and study His word, to listen for His voice and worship and cry out for His mercy on this land, things are coming into place. As people individually and in groups hear God's instructions for them and choose to obey, the atmosphere is changing, and the fields are growing ever closer to the harvest. Thank you for adding your prayers to those of the thousands, both in this nation and around the world, that know that God is developing His special plan for Wales. More international blessings and God's perfect timings! This last week has been extraordinary with nary a dull moment. 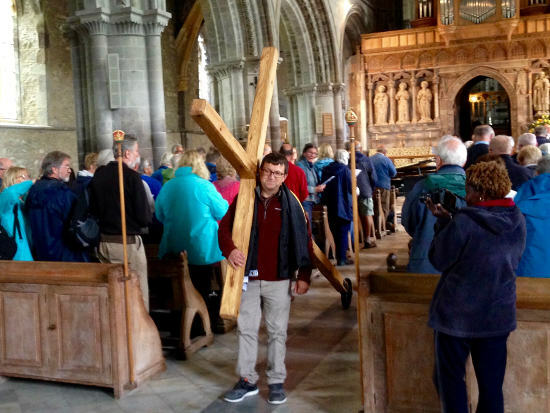 As I mentioned in last week's update, Tuesday was the kick-off for the Crossing Wales pilgrimage at St. David's Cathedral on the southwestern tip of Pembrokeshire. The concert was marvelous, and a precious experience of classical worship. Of the roughly 200 people present, many were moved to tears. Both the brief message and commissioning prayer by Canon Dorrien Davis were wonderfully spirit led and powerful. 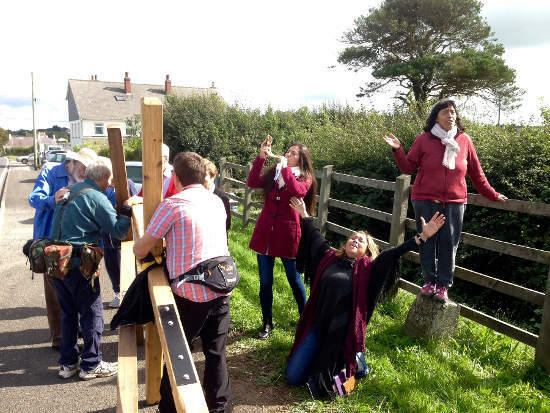 The essence was that Wales needs to return to the simple faith in the Gospel of Jesus Christ, and that this public witness of the cross might touch many, many lives. This special sending off has already proved effective. Emyr told me on Saturday that they lost count after 8 or 9 people give their lives to Christ, and have had opportunities to witness to many others. Also, along the route many Christians have stopped to pray for them and bless them as they make their towards the north. On Wednesday two young ladies from Singapore came to spend a couple days with us. Besides taking them to our chapel and a few other places, we had some wonderful fellowship. One's father had been saved in the outpouring of the Holy Spirit there in the 1970's and had just co-written a book about it with her brother. So they had lots of stories, and were interested to hear our stories of the same time period. 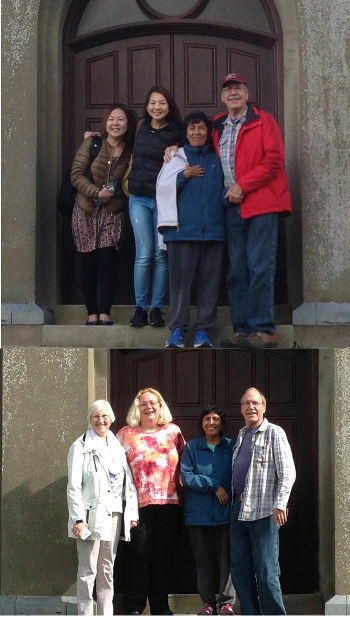 While they went Thursday to Ffald-y-Brenin, we spent some really wonderful time with two intercessors from Austria. After some tea and Gladys' delicious apple pie, we went to the chapel and had a fantastic time of anointed prayer. They also brought us an Austrian flag, so our little collection is growing and reminds us to pray for those nations. Then on Friday we had a "changing of the guard" and received Nidia from Colombia and her friend Natalia from Argentina! Both are students at the third 12-week course that just started at the Bible College of Wales. We first heard from Nidia early last year, and so it was nice to finally meet. 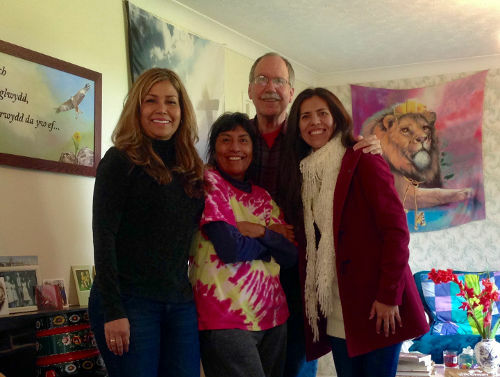 Because Spanish is the main language in our home, we had a really great time together. 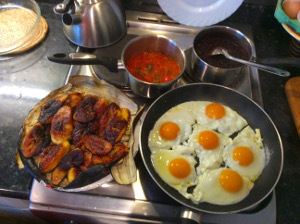 They brought us some platanos (plantains) so we had a delicious Latino breakfast too, tortillas and all. Natalia is a gifted musician and worshipper and we spent some sweet time in Gods presence. They were both brimming over with their experiences at the BCW, and we were all deeply moved as we shared together. When we told them about Emyr's carrying the cross, they immediately exclaimed how they would love to meet and pray for him. Well God being God, and knowing the desires of our hearts, He had that all prearranged. After breakfast we took them to pray at the chapel in Blaenannerch. We had a really exceptional time of prayer there, and the bending of hearts was piercing through to the heavenlies for sure. And then, as if carefully orchestrated, when we finished after a lengthy session and went out to the front of the chapel, at that very instant the two crosses were passing directly across the road before our eyes! As always, the Lord is far ahead of us and we are constantly amazed at His perfect ways and timings. Needless to say, we were delighted for the opportunity to pray and strengthen Emyr and Lindsay. And our friends were more than thrilled and blessed as well. And as if that wasn't enough, while we were with a small group gathered for prayer waiting for them at the end of the day's walk, I got a call from our friends Bryn & Sylvia in Canada. Without any knowledge of what was going on, they were wanting us pray a blessing over the official opening meeting of their newly finished prayer room. So just as I went outside to video-chat with them and I told them where we were, in came the two crosses! I asked Emyr and Lindsay pray to for them right then and there, and a short burst of live international prayer was a more powerful blessing for our Canadian brethren than they were hoping for. Thank you once again for your continued interest in and prayers for us, for Wales and for the nations! 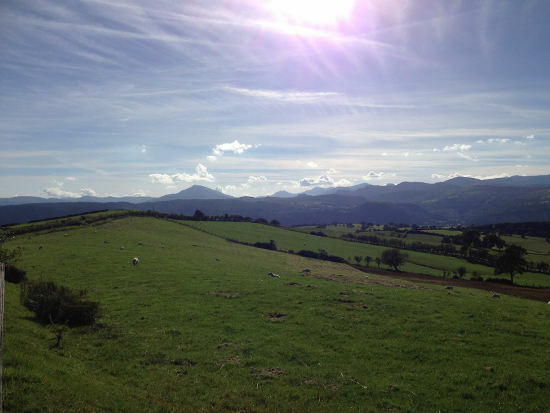 Last week someone sent me a couple of prophetic words given for Wales very recently, and I will post them both on the Words About Wales page that I update from time to time. I will quote the shorter one here. They are both very encouraging and fit hand in glove with the growing sense of expectancy in the land. This week is also the start of the Pilgrimage of the Cross. 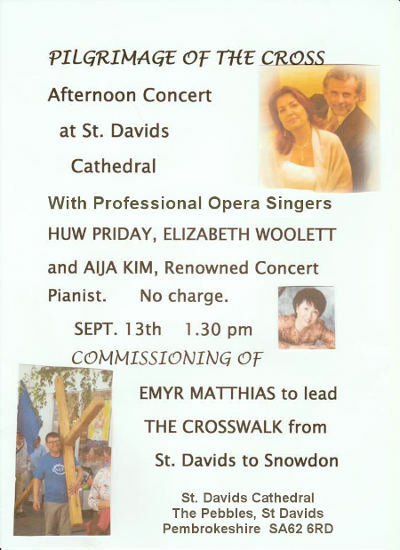 Our friend Emyr Mathias will be commissioned at St. David's Cathedral on Tuesday at a special service and concert. From there he will set off the next morning for Mt. Snowdon in North Wales. It is nearly a 4 week journey, and there will be events organized along the route. For details of dates and places, see the website CrossingWales. Other cross carriers will be joining him and will come together for the ascent of Mt. Snowdon on October 8th. We believe this is a significant event - Emyr's carrying the cross along the roads has impacted many people already. People have stopped to ask him what's it about, and to thank and encourage him. And some have wound up in tears and been really touched by the Lord. So please pray that there will be lots of opportunities to share the truth and glorious hope that we have in Jesus! We had a wonderful week with more visits and goings on. We spent Thursday with a small group from Singapore, and had sweet fellowship and some truly amazing times of prayer. 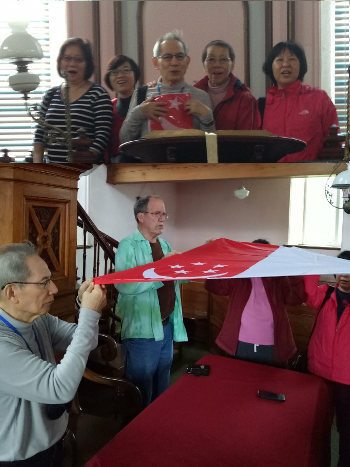 One special time took place in our chapel, praying for blessing and anointing from Singapore into Wales, and then sending blessings and revival anointing back into that small island nation that has made such valuable investments into this land, such as the redeeming of the Bible College of Wales and Pisgah Chapel. 'They are the excellent ones, in whom is all my delight.'" 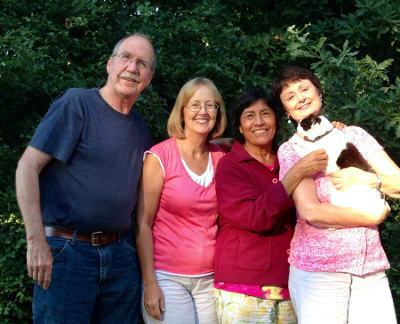 Our dear friends Marilyn (with our cat) and Margie are sisters from Pembrokeshire who are missionaries respectively in the Czech Republic and France. We've known them for many years and they are such godly examples of loving and faithful service in the Lord's vineyards. Would you please pray for each of them and their ministries? Also please could you pray especially for their parents, who are both in their 90's and still living at home. Margie has had to stay behind with them due to some difficult health issues with their father just now and they all need some special grace and healing. Thank you. 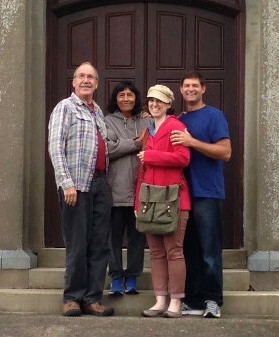 Then there were another few wonderful and very exciting visits from some local friends, as well as another younger couple, Troy and Andrea from Pennsylvania. 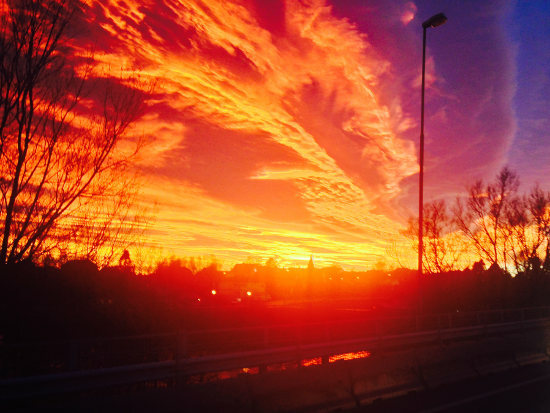 They were only with us for a few hours, but wow! What a time we had - such prayers, and testimonies of God's love and patience and transforming power. We could easily have gone on for days, but they had many other places to see and pray. Needless to say we were very blessed and encouraged their brief visit. 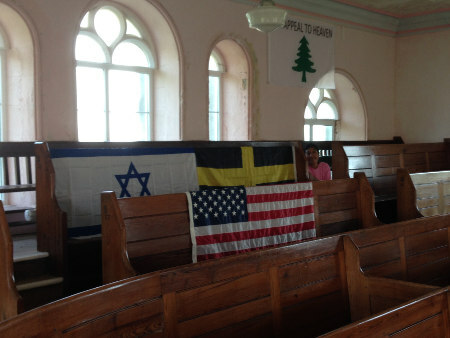 They also they brought us a U.S flag which we now have up at the chapel with a few others from the 25 countries where people have come from and prayed with us here. I just heard from them last week saying, "Our revival meeting on Saturday night was well attended by 10 churches of all denominations. Crying out for revival! There were about 300 people in attendance. More Lord!!" There is such a hunger among the nations for a mighty outpouring of God's Holy Spirit and the coming awakening! Later that last week of August, we drove to the coastal town of Colwyn Bay in North Wales for a small but significant Wildfires Revival Conference. There again we witnessed more of this increasing desire God's intervention in the hearts of men and the affairs of Wales and the nations of the world. 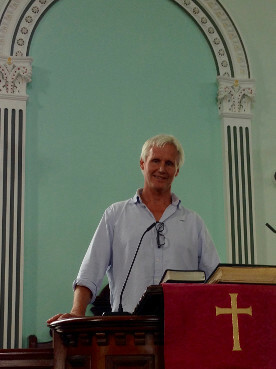 The main speaker was Michael Marcel, author of God's Heart for a Dying Land and Prepare for Revival. His teaching was rich with historical narratives of past revivals, and challenging as we look to God for what's ahead. I had been invited to speak at both Sunday meetings to end the conference, and that was a bit of a stretch for me, but God's grace is always sufficient. The word the Lord spoke to me last September about the Kidron Brook was impressed even more deeply in my heart having just been in that very place weeks before, and so I shared that in the morning. I was gratified to learn afterwards that there were more tears than just my own. The evening meeting flowed much more easily. After showing an old 10-minute video about how the Lord called us here in 2002, it was easy to relate some of the many things we've seen the Lord do over the years: the redeeming of the Bible College of Wales and other properties according to the words of Jeremiah 32:15, wonderful networks of prayers being established, testimonies of God's manifestations, prophetic words, etc. Once I got going it was hard to stop, and when I did, they asked for more! It was such fun, and a great encouragement and stimulus for us all. The Lord literally put the following verses in my hand to finish off with and empower our prayers in Psalm 22:27-28. "All the ends of the world shall remember and turn to the Lord, and all the families of the nations shall worship before You. For the Kingdom is the Lord’s, and He rules over the nations."